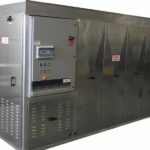 A Juicy Job for a Cool Machine | Berg Chilling Systems Inc.
Berg’s Industrial Shell Icemaker has Provided a Creative Solution to one Food Processing Company’s Juice Freezing and Storage Problems. The modified 10-ton shell ice machine is capable of freezing juice at 21 to 22 percent solids, which is 5 percent higher than the bag system previously used. 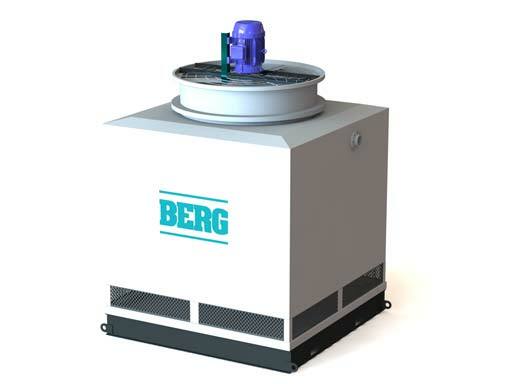 For over 25 years Berg has been manufacturing Shell Icemakers for a wide range of industrial processes and industries. Because the unique ice type is operator adjustable for thickness, it has been found to be useful in many processes including; the packaging of perishables (fish, poultry, produce); as a process ingredient (baking, processed meats, concrete); creation of an ice slurry, party-ice and specialty applications of direct product freezing (blood plasma and now juices). How the Berg Shell Icemaker works: Shell ice is formed on 6” diameter stainless steel tapered evaporators. Water cascades across both the inner and outer tube surfaces, which contributes to the superior operating efficiency of the Berg Shell Ice Making Machine. Once the desired ice thickness has been reached (operator adjustable), the automatic controls will terminate the flow of liquid refrigerant to the evaporators and initiate the flow of hot gas refrigerant. The introduction of hot gas forms a thin layer of water between the ice and the tube surface allowing gravity to easily pull the ice off the evaporator tubes. As the ice slides off the tubes, the discharge auger (or beater bar depending on the style of icemaker) removes the ice from the machine. Once again, gravity or another mechanical delivery device will take the ice to storage. Any free water on the shell ice surface will quickly re-freeze on the sub-cooled Shell Ice, leaving dry, hard ice fragments. One of the many advantages of the Berg shell ice machine is the absence of moving parts for harvesting the ice. Unlike other types of icemakers where cutters or scrapers are used to remove the ice, the Berg Shell Icemaker uses the reverse refrigeration cycle and gravity (described above), so fewer mechanical parts are required. An auger or a beater bar assembly (depending on the machine style) is used to simply remove the fallen ice from the machine. The Berg Shell Icemaker can produce a variety of ice types ranging from a hard clear pure-water ice to a soft white seawater ice, each of which have advantages for different applications. Due to the nature of the freezing surface on which the ice is formed, Shell Ice will exhibit superior handling characteristics. The curvature of the ice prevents the formation of solid fusing or bonding while in storage; enabling the ice to be easily mobilized once disturbed. Berg was approached to help solve a product-freezing challenge. Our customer “Sepallo Food Ingredients” manufactures quality fruit and vegetable powders, providing whole fruit powders, rich in natural fibre as well as soluble juice powders that are highly concentrated with great intensity of both flavour and colour. They market their fruit and vegetable powders primarily as bulk ingredients to manufacturers in the food and natural products industries. The challenge they faced was finding a way to improve their freezing process. Grass juices of various varieties are frozen on the shell ice machine. Shown is wheat juice cascading down the evaporator tubes and freezing on the tube surface. Too much of their high quality first-cut product was ready for harvest early in the season for their dryer to handle, and once the harvest season was over they needed to look for other sources of materials to keep their dryers busy in the winter months. In order to maximise their own organically grown harvest of high value and high quality wheat, oat, pea and spinach plants, they had been hermetically sealing the excess juice from the primary process (the evaporator) in 20kg plastic bags and batch freezing the product in their storage freezers. They would then bring the frozen bags out later in the year and further process it in their dryers. In order for the juice product to freeze properly in the bags, they had to hold the level of concentrated solids in the juice to about 16%. If the concentration were greater than this, they would experience problems freezing solid in the core of the bag. They also found that the frozen 20kg juice bags were more concentrated in the centre of the bag than at the periphery i.e. the percent of juice to water increased from the periphery to the centre of the bag. This is commonly seen in a typical ice cube, where the outer part of the cube is clear (pure water) and the inner centre is cloudy white (solids). This is a result of the pure water freezing first on the outer colder surfaces and the solids concentrating at the centre, the last place to freeze. In order to resolve these issues, Brad McNish inquired about using the Berg Shell Icemaker to process the excess juice, freeze it in bulk and deliver the frozen juice directly into reusable and stackable ½ ton storage totes with securely latching lids in their freezer. To freeze juice product such as wheat juice, the tube surface must be cold enough so that the liquid and solids freeze as one homogeneous product on the evaporator tubes. Process considerations: Since the juice product was to be in direct contact with the icemaker, daily cleaning and sanitation were paramount concerns. The machine would require daily flushing of the distribution lines and contact surfaces with high-pressure washers and sanitizing agents. The second concern was the ability of the juice to flow through the distribution lines and coat the freezing surfaces (evaporators) with the juice, to produce frozen fragments of “juice-ice” which would be easily mobilized at a later time for further processing. The third concern was whether the Berg Shell Icemaker could freeze a product with such a high level of solids and to what extent the icemaker could maintain a consistent concentration of juice both throughout the frozen nugget and from batch to batch. 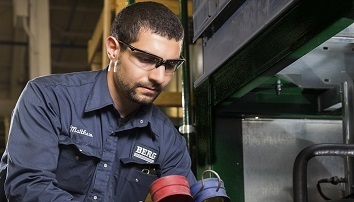 Berg had not previously frozen a product with so much particulate matter on their machine so they requested that the client deliver a usable sample of the product to run through a conventional Shell Icemaker to see how the product would work with their machine.From that knowledge they would be able to determine what modifications would be required in the final solution. Since it is pure water that freezes first in the ice making process, they were concerned about the fact that the juice solids would wash off the tubes to concentrate in the recirculation tank (as described above with the ice cube). Berg was also concerned that the juice product would not freeze well to the tube surface and result in producing juice slush rather than a hard frozen juice nugget. To address their preliminary concerns about the juice product there were only a few modifications required to ready the conventional icemaker for the test. One involved opening the distribution nozzles to allow for the solids to pass through to evenly coat the tubes with juice. The other was to ensure there was ample refrigeration capacity. The presence of an abundance of solids in the juice would mean that the freeze point of the juice liquid would be lower than pure water and Berg would need to ensure they could get the tube surface cold enough so the liquid and solids would freeze as one homogeneous product on the evaporator tubes, leaving little opportunity for the solids to wash off. – The concentration of juice solids remained practically the same as the liquid juice supplied to the ice machine. – The frozen Juice was hard frozen into manageable nuggets and was easily able to be conveyed. – Plans for the production version began. Wheat juice frozen in dry, fragmented pieces is removed from the freezer. The end result was a successfully modified 10-ton (per day) industrial icemaker that is easily cleaned on a daily basis to meet the stringent sanitary conditions of the food processing industry. Now in production, grass juices of various varieties are frozen on the Berg Shell icemaker. The frozen juice is automatically conveyed from the end of the ice machine’s discharge auger to a connecting auger that delivers the juice ice straight into the freezer. Once inside the freezer the ice falls into the reusable and closable totes until the tote is full. It is then sealed, labelled for batch identification, stacked and stored in the freezer for further processing later in the season. The plant operators have discovered that they can actually freeze a more concentrated juice on the Berg Shell Icemaker so they are evaporating more water our of the juice before sending it to the Icemaker. Since the product is now entering the freezer already frozen, they are no longer experiencing temperature fluctuations with the introduction of new product and the product already in the freezer is being held at a constant temperature, eliminating the potential for oxidation to occur. The result was an instant freeze of the juice, preserving its quality for processing later and significantly reducing labour. “Now that we are using the Berg freezing system we are literally freezing instantly and the frozen juice when measured is showing zero signs of browning through oxidation. This literally impacts our bottom line. Since it is a requirement from some of our customers that we meet a minimum chlorophyll level…..our thawed juice from the Berg freeze system is literally the brilliant green of fresh juice.” Says McNish Sepallo has found that the Shell Ice shaped juice nuggets have resulted in easier handling and greater surface area of the juice nuggets allows for faster thawing which requires less energy and time. They have purchased a bin dumper for Wheat juice cascading down the evaporator tubes and freezing on the tube surface. Wheat juice frozen in dry fragmented pieces being removed from the freezer their forklift, which will remove the manual component associated with handling the 20kg blocks as before. Cost savings though reduced freezer operating costs and manpower savings. Improvements in product quality and production yields. 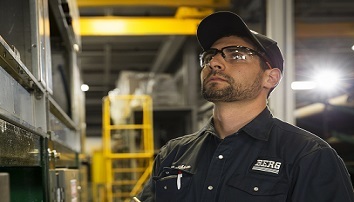 About Berg Chilling Systems Inc.
Berg Chilling Systems designs, manufactures, installs and services industrial thermal process control systems for a broad range of industries and specialized applications around the world. Over the past 40 years, we have pumped, chilled, frozen and heated our way to the forefront of global thermal management solutions. Our product range is as diverse as the markets and industries we serve. 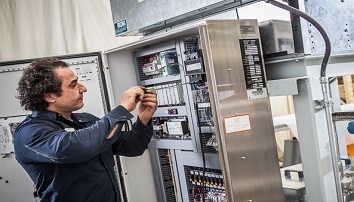 From our Toronto based facility, we custom design, manufacture, test and integrate a wide range of skid mounted industrial process refrigeration equipment, mechanical packages and fluid pumping systems for ease of installation and commissioning.